A look into how far these young professionals are from earning a scholarship for playing eSports competitively. THE VIRTUAL COMMUNITY OF ESPORTS IS EMERGING INTO THE SPORTS WORLD, WILL IT GIVE TRADITIONAL SPORTS A RUN FOR THEIR MONEY? The Paris stadium was filled with fans banging inflatable noisemakers. Their cheers and screams echoed throughout the stadium. 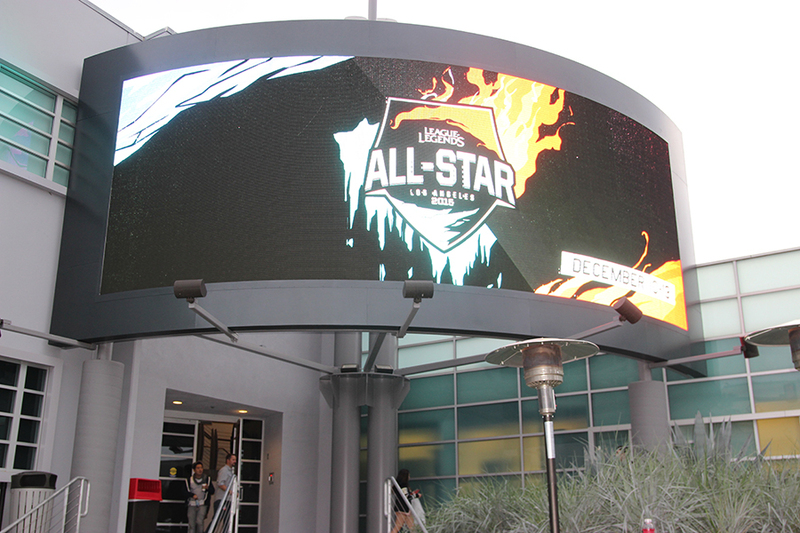 Three screens at the front of the arena bathed the 20,000 people attending in a hue of fire red and ice blue. The 10 professional video gamers took a seat behind a computer monitor and prepared to compete in the ESWC Paris 2014, a popular eSports (electronic sports) competition in which 16 qualified teams from around the world compete for millions of dollars in order to determine the top video game player. "When we were walking on the stage, I'm sure it felt like the first time any sport player walks into a stadium. Our hearts were beating hard, I saw the audience and thought 'wow, all these people came to watch me play'," said Caroline Noquez, professional eSport player who competed in Paris. Her fans know her as ArtStar, the 20-year-old top professional female in a game called Counter Strike: Global Offensive (CS:GO). She plays on "Team Karma." "eSports", a globally popular gaming competition, currently packs prominent sport arenas, gaining an audience of more than 100 million, and has a large involvement with both major brand investors and mainstream media. There are 205 million people who have watched or played eSports, according to a 2014 report from market research firm Newzoo, which means there are more participants in eSports than people living in Brazil. 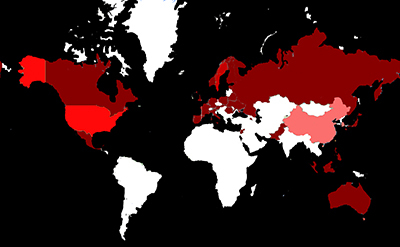 There are over 30 annual world championships for the most popular games according to the technology news outlet Digital Trends, with its biggest popularity coming from South Korea, the United States and China. "When we were walking on the stage, I'm sure it felt like the first time any sport player walks into a stadium." These competitors travel around the world, practicing endless hours and days to become the best in the world. Click on Noquez and Powell to hear more about them and other professionals. Noquez is a full-time gamer and streamer. "I don't have a job and I dropped out of college to focus solely on CS: GO," said Noquez. 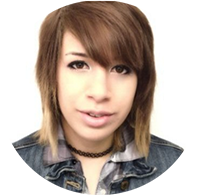 According to Noquez, her equipment and travel expenses are funded by her sponsor, the gaming accessory manufacturer Steel Series. She won the 2016 Intel Extreme Masters playoffs to head to Katowice, Poland, to represent the North American female team in the eSport game of Counter Strike: Global Offensive, a first-person shooting game. Although her lifestyle can be compared to a professional sports player, her family did not always support her because she chose this lifestyle over finishing college. "At first my parents were so furious that I had taken a break from college to play games that I had to keep Paris a secret when we made it to the finals," said Noquez. "They finally accepted my passion when they saw my name on television surrounded by thousands of people cheering me on like a celebrity." 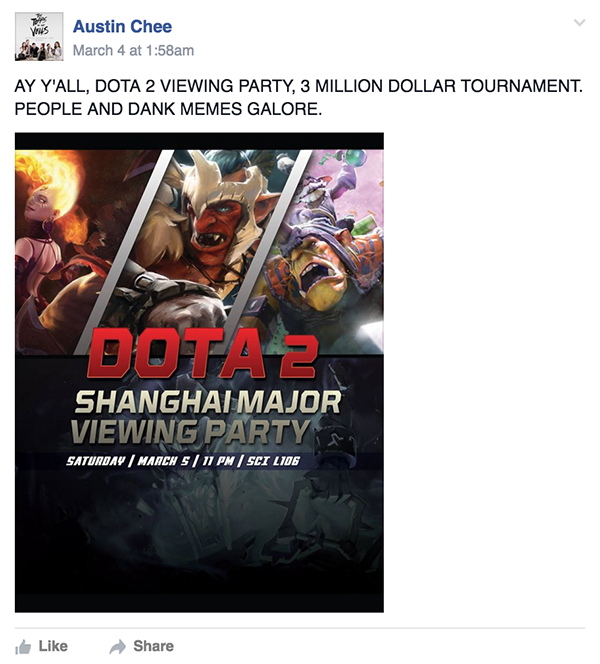 eSports are just like any other competition. Click to find out more about this emerging global competition. eSports is just like any other competition. 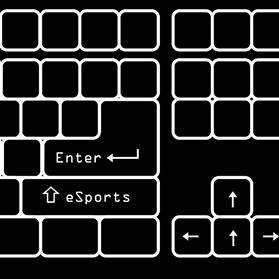 eSports is a mental competition that does not require physical strength. It is co-ed gaming played professionally by both female and males. They draw a mass audience of people watching the best, highly paid, skilled professionals around the world play video games streamed over the Internet or seen on screens in stadiums and large arenas. The eSports community has experienced exponential growth over the past eight years. The professionals who play these video game competitions typically range from ages 18-23, and often receive the same popular admiration and fan base as traditional sports athletes. There are various types of games that are considered "eSports." eSports games come in many forms, such as fighting games that consist of two players virtually fighting against each other. Games like Nintendo's Super Smash Brothers, and Capcom's Street Fighter are in that category. There are first-person shooting games that involve two teams dodging and shooting opponents for points on a map built with barriers and hiding spots. These games include Xbox's Halo, and Valve Corporation's Counter Strike. The most popular eSports games today are strategy games that consist of two teams of five players each. A player controls one character on a team and uses a limited amount of abilities of their choosing to take over an entire battlefield. An example of games like this would be Valve Corporation's DOTA 2 and Riot Game's League of Legends. 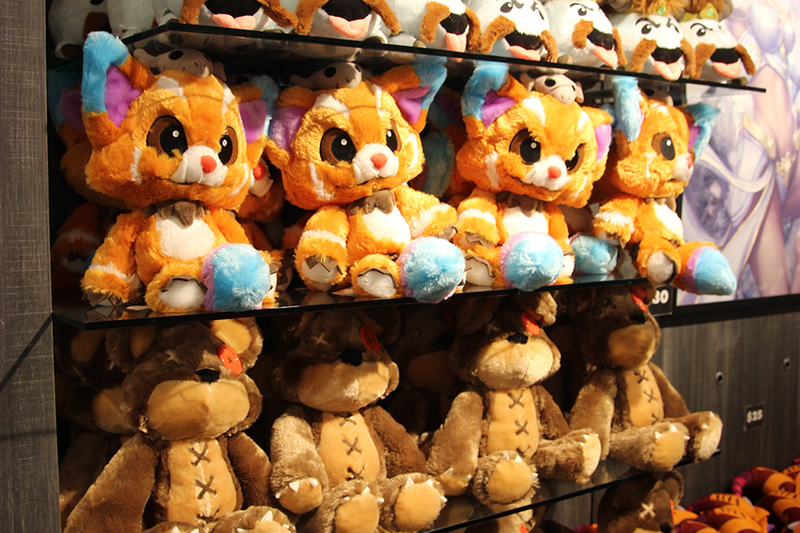 League of Legends is one of the most popular games with 27 million active users and 67 million monthly users. Each of these players has a chance to play in the year end League of Legends World Championship Series (LCS) , which garners a $2-million cash prize. 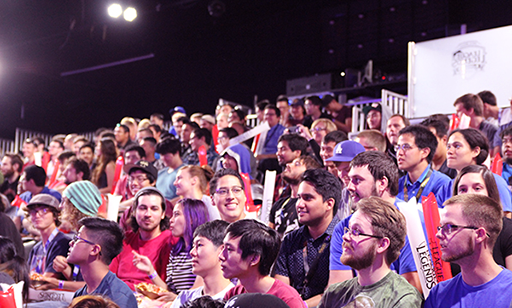 All-female tournaments are held for a smaller audience with a smaller cash prize. The Intel Challenge Katowice: Intel Challenge Global was held in February 2016 and gave out a $30,000 cash prize to the top female Counter-Strike: Global Offensive teams. eSports, or competitive gaming, is an entertainment competition based upon single players or teams playing video games against each other for prize money and fame. 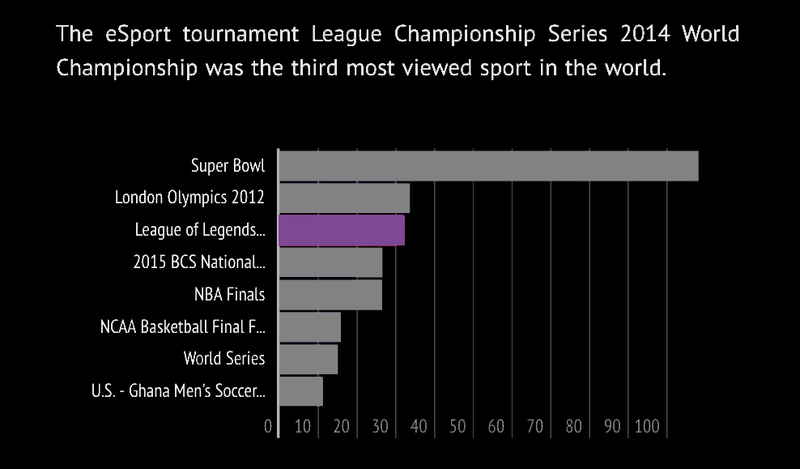 Did you know that in 2014, an eSports championship game was the third most viewed final game of any sport? 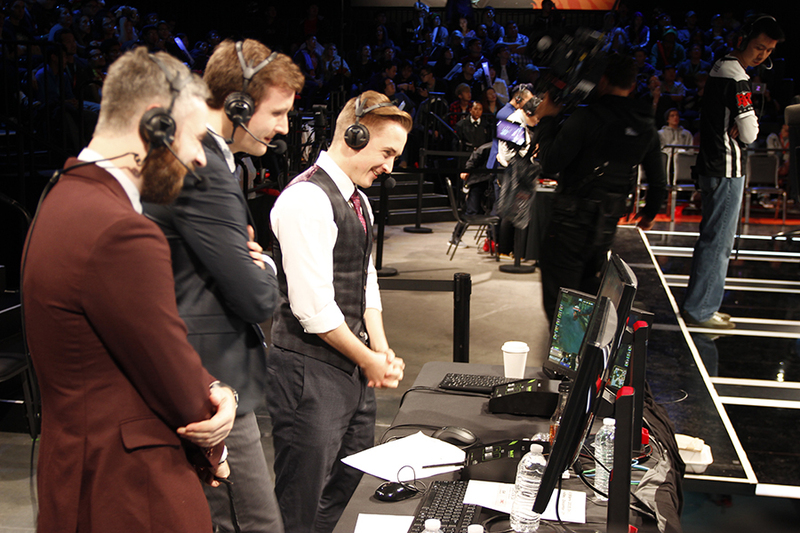 Click for more information about viewership ratings and prize pools of eSports. Players range in age from 18-26, with an annual salary provided by investors of an estimated total of $90k per person a year. They compete all over the world in venues of various sizes. 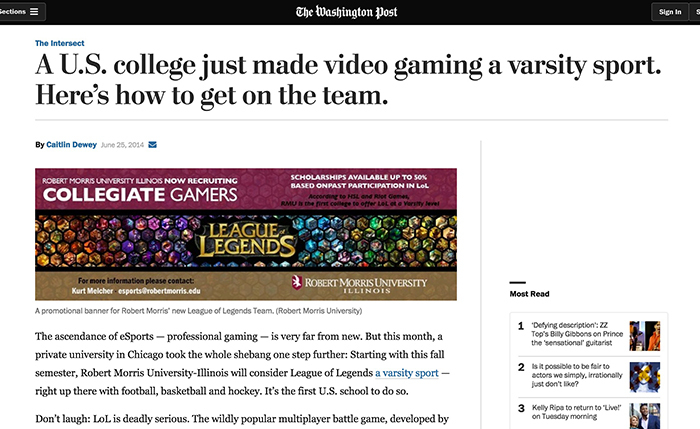 These competitions are becoming so popular on college campuses that Robert Morris University, a small private school in Chicago, is actually offering varsity scholarships to eSports competitors. Associate Athletic Director Kurt Melcher is currently the director of the eSports team at Robert Morris University, and said the video game competition was very similar to traditional sports. "We're not saying it's athletic, but that it is an electronic sport," Melcher told the Chicago Tribune. "I don't think anyone can deny that it is a legitimate competition that takes very strategic minds to be successful." 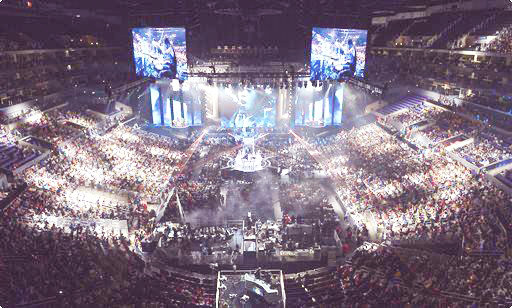 The 2013 eSports League of Legends World Championship Series not only surprised critics with its high viewership ratings, it sold out the Staples Center in Los Angeles, which holds 18,000 people. 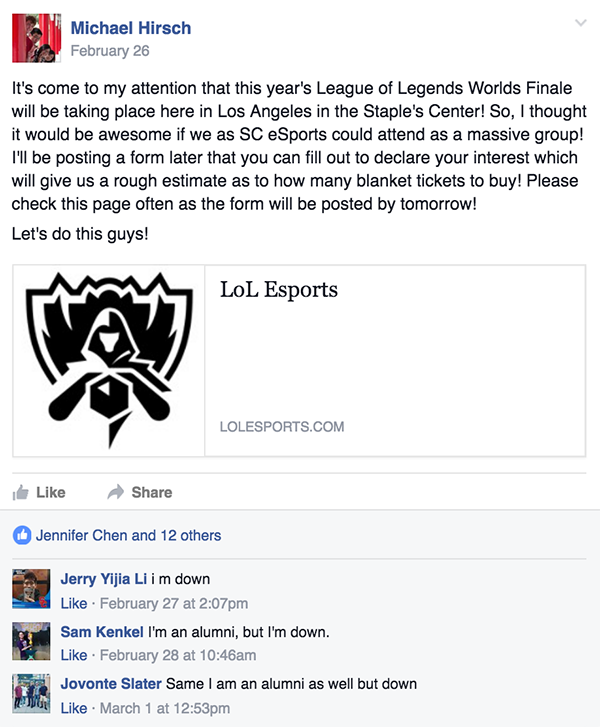 The tournaments' twitter page, @lolesports, announced that the tickets for the tournament at the Staples Center had been sold out an hour prior to announcing the tickets were released. The "sport" has packed prominent sports arenas globally. South Korea's second largest sports stadium, which once hosted the 2002 FIFA World Cup Championship, hosted the League of Legends World Championship Series in 2015. The entire stadium was packed of 45,000 audience members engaging in ten players playing games. League of Legends eSports announced that the tickets for the League of Legends World Championship Series Season 3 were available for purchase. 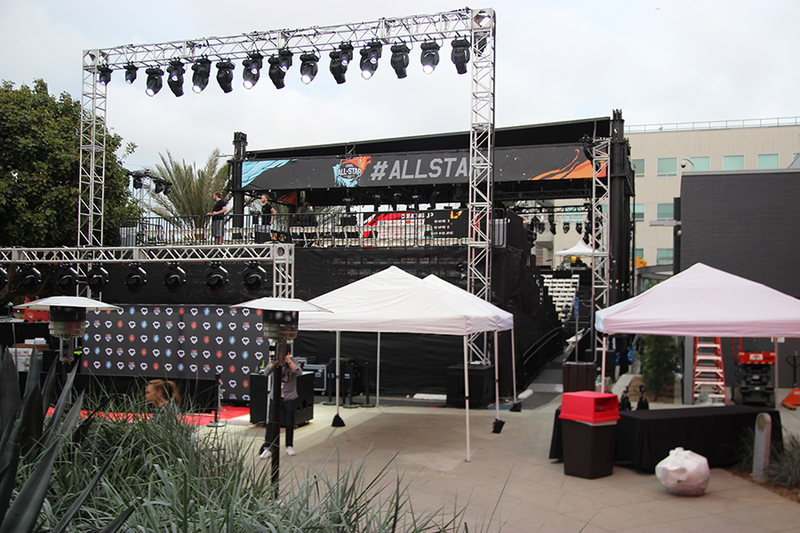 The tournament was said to be held at the Los Angeles Staples Center. 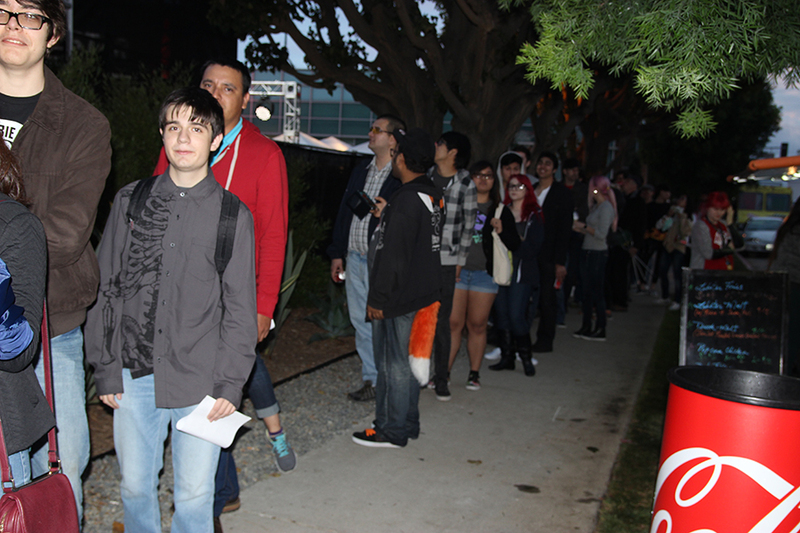 The tickets for the League of Legends World Championship Series Season 3 were sold out within an hour of them being available. This global competition has generated 134 million viewers in the last year, according to SuperData, a leading provider of market intelligence covering the market for gaming by using digital point-of-sale data received from publishers, developers and payment service providers. 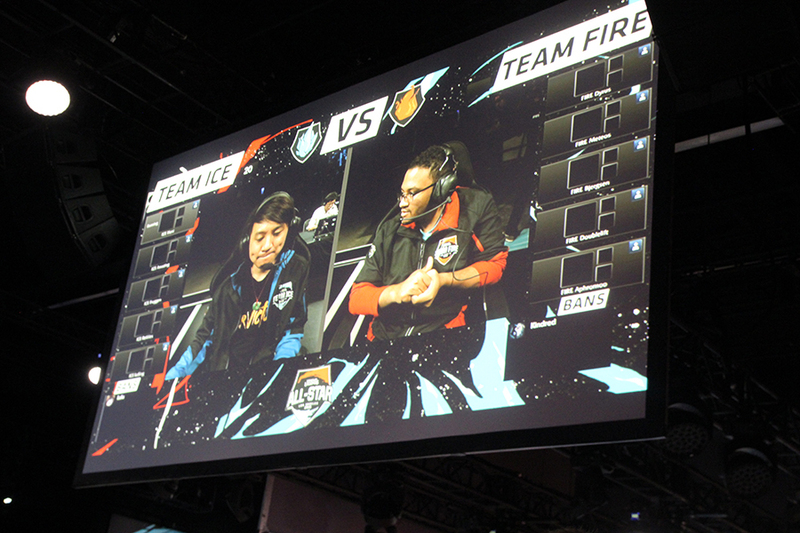 The eSports community also includes all-female competitions such as Caroline Noquez's team, Team Karma. "Our biggest audience was probably at ESWC Paris 2014," said Emma "Emuhl33t" Powel, the team captain of Team Karma. "We had over a thousand people watching us play finals on stage at the event, and over 20,000 people watching online through Twitch online." Director of PR at Twitch.tv, who only goes by the first name Chase, said Twitch is "currently the biggest platform for viewing eSports broadcast" with over 30 million watching the eSport competition League of Legend World Championships on the website in 2013. 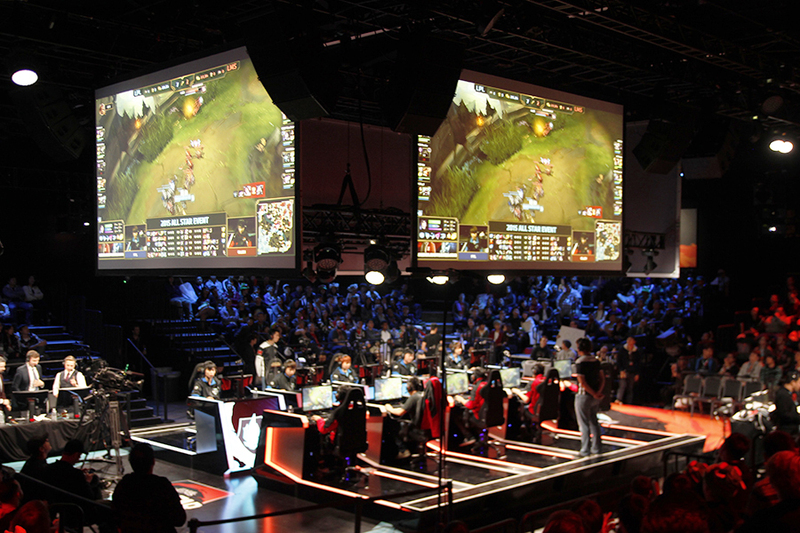 The competitions are now comparable to traditional sports in America, with the 2013 eSports League of Legends viewership beating the NBA Finals, World Series, and the BCS national championship game. 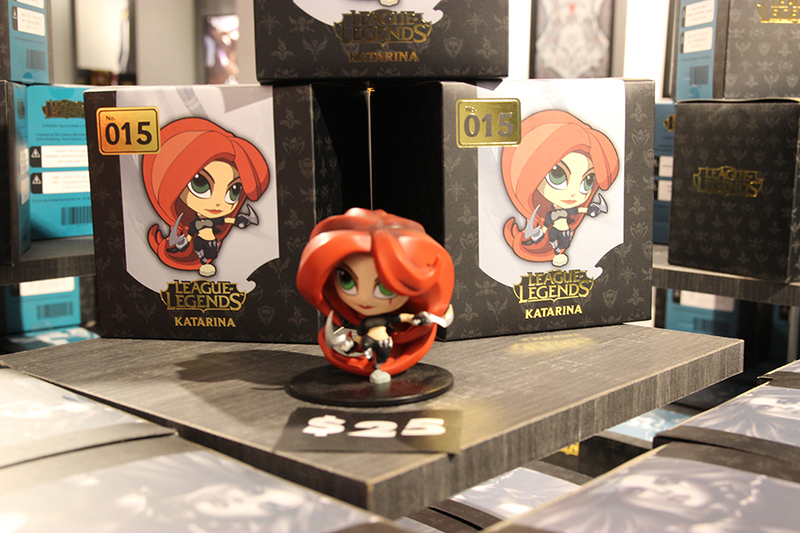 According to Kaitlin Stewart, Riot Games Public Relations Director, the 2013 League of Legends Season 3 World Championship had 32 million people tune in to watch the game, with 8.5 million peak concurrent. Watch a YouTube video of the game here. 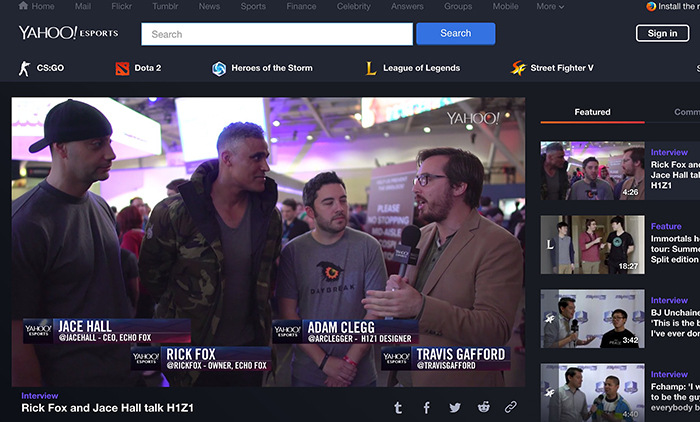 According to online streaming website Twitch.tv and T.L Taylor, author of Raising the Stakes: eSports and the Professionalization of Computer Gaming, an average eSports viewer watches 19 times a month, with a session length of 2.2 hours. The fans are not only watching, but also sustaining a loyalty to the game. Along the sidelines of these events are the banners of major companies now investing in eSports. 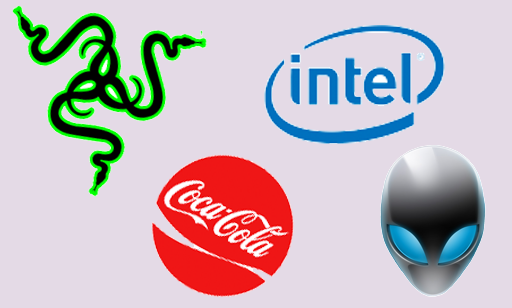 Coca-Cola and American Express are some of the most popular brands to sponsors eSports. In an online article on The Daily Dot, Matt Wolf, Coca-Cola's global head of gaming, commented on the companies recent partnership with game developers Riot games. "eSports is at a point now where the company feels like it's time to move into the industry," said Wolf. "There are several signs that show that this is real, it's sustainable, and the growth is astronomical." Team Karma is currently sponsored by Steel Series, a manufacturing company of gaming peripherals and accessories such as headsets, keyboards, mice, and gaming surfaces. 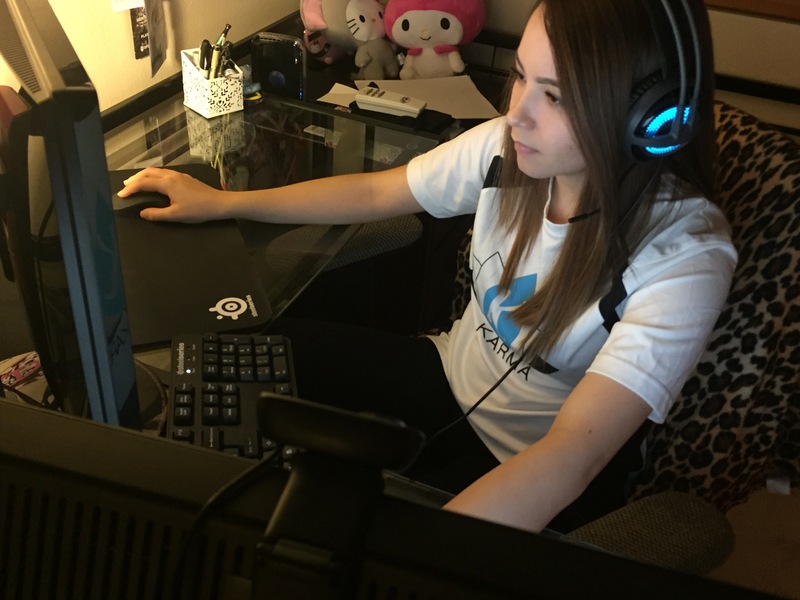 "Steel Series provides us with gaming gear so we don`t have to spend our own money on it and can save our money to buy our tickets to travel to events, and they also provide us with a small amount of travel support," said CS: GO professional player Emma Powell. "We are so blessed to have this because if we didn`t we would still be having to use our own money from work to buy all these things." Team Karma is currently sponsored by gaming manufacturing company Steel Series, and receives majority of their equipment through the company. While most teams have a contract with a sponsor, Powell said Team Karma just received sponsorship from Steel Series as of 2015. "During ESWC Paris 2014, we all had to buy our own $1200 tickets to fly while most of our competitors had a free trip," he explained. Prominent companies like Coca-Cola are not the only ones who have seen signs of a sustainable new type of "sport"; media coverage of the sport has been highlighted in both news outlets and on prime time television through Charter Cable. 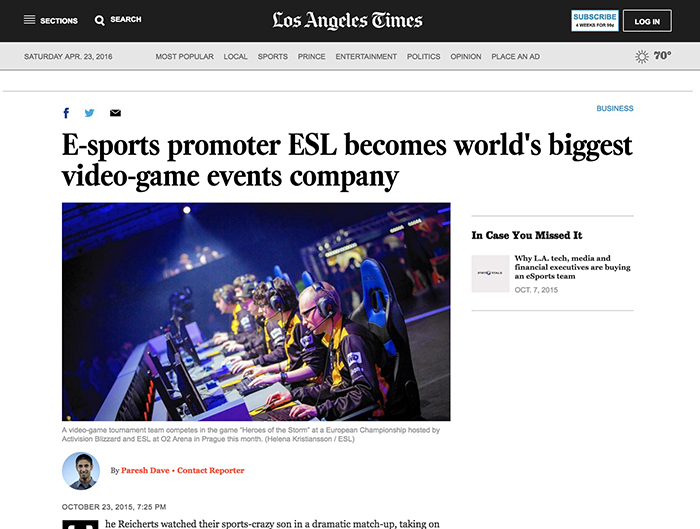 In 2011, small gaming news publishers Kotaku Gaming News and Gamespy.com were the only outlets that covered eSport tournaments. These small publishers were the first "real" media coverage the sport ever received. 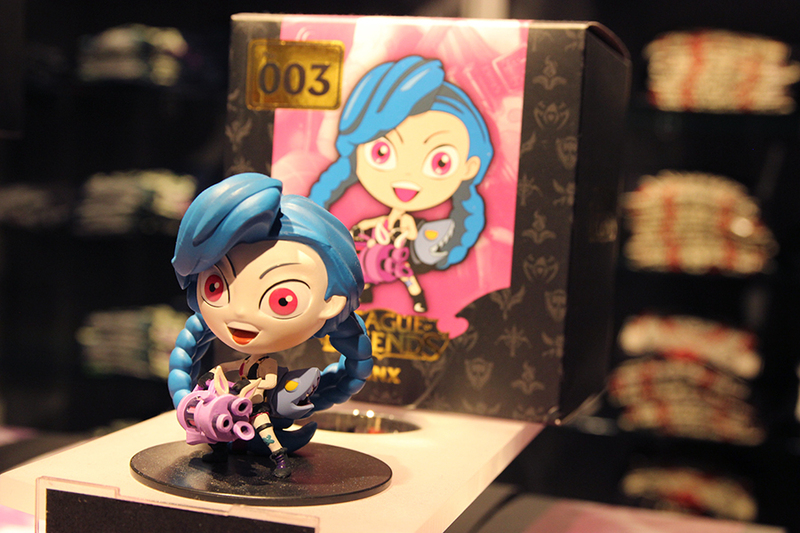 Once the results came out that the tournament grabbed the eyes of 300,000 viewers, with a peak of 69,000 watching at the same time according to Riot Game Media Relations Manager Bob Colayco, the mainstream media became immersed with eSports coverage. 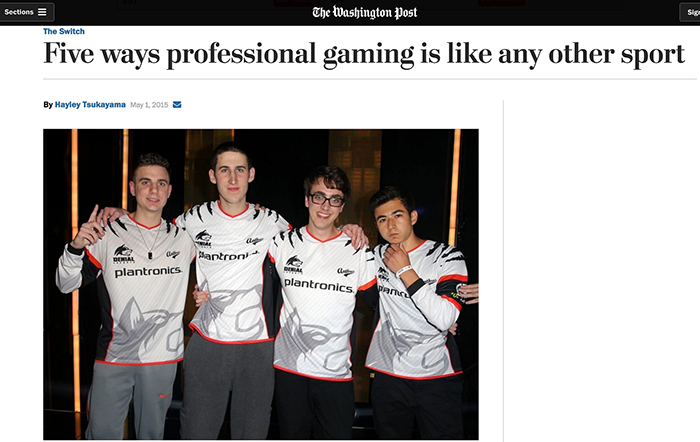 Mainstream media outlets, Forbes Magazine and Yahoo News, covered the 2012 League of Legends tournament, including the pool prize of the tournament, professional player's lifestyle feature and reaction to the yearly tournament's expedient growth. 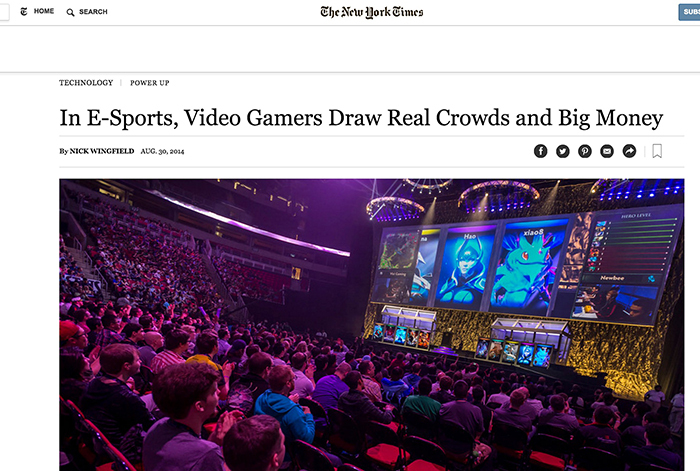 The New York Times and the Los Angeles Times currently cover the topic of eSports on a weekly basis to keep up with the growth of the popular competition. 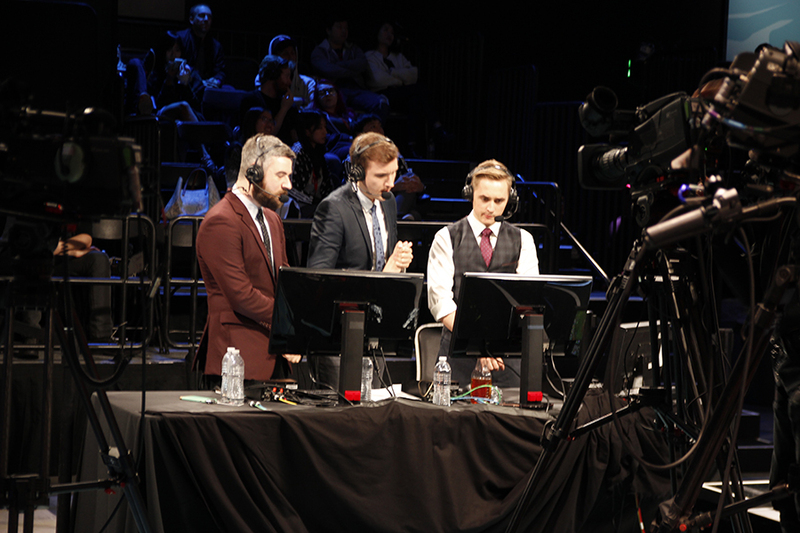 Global eSport tournaments have gained enough popularity to hit cable television as of 2016, and receive airtime on ESPN and TBS, which now air eSports regularly on the weekends from 6-8 PM PT. "Today's launch ... is our latest push to reach and connect with this growing and passionate audience," said Chad Millman, editor-in-chief of ESPN.com and ESPN The Magazine, in a press release. 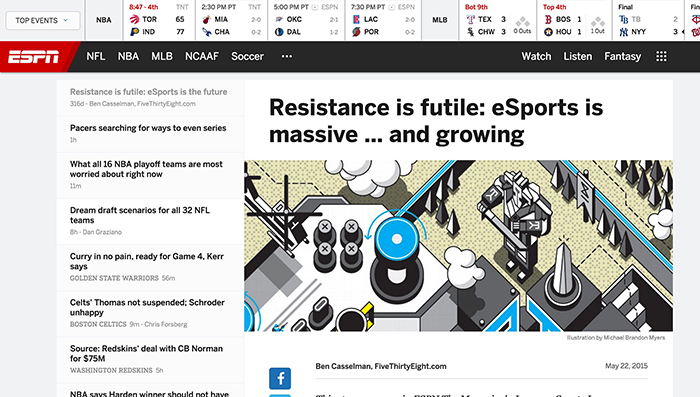 "Fans will find the same level of quality content and journalism that users of ESPN.com have come to expect, including in-depth looks at the competitive gaming world and on-site reporting from the major tournaments." ESPN2 hosts a collegiate eSports tournament for the multiplayer online computer game "Heroes of the Storm"
So, why haven't the players or college administrators approached the NCAA about receiving scholarships for such a strategic competition that harnesses hand eye coordination and strategy? Only a selected few of the top players, who range in age from 18-26, receive an annual salary provided by investors of an estimated total of $90k per person a year. Will this temporary salary be enough to give young competitors a successful future after their professional careers? 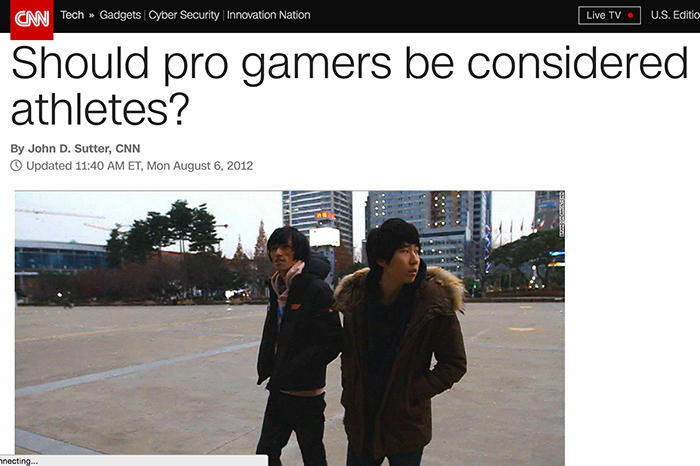 Or will eSports lead to an uncertain future? Professional players such as League of Legend's Cuong Ta do not think about this type of thing during their competitive careers. 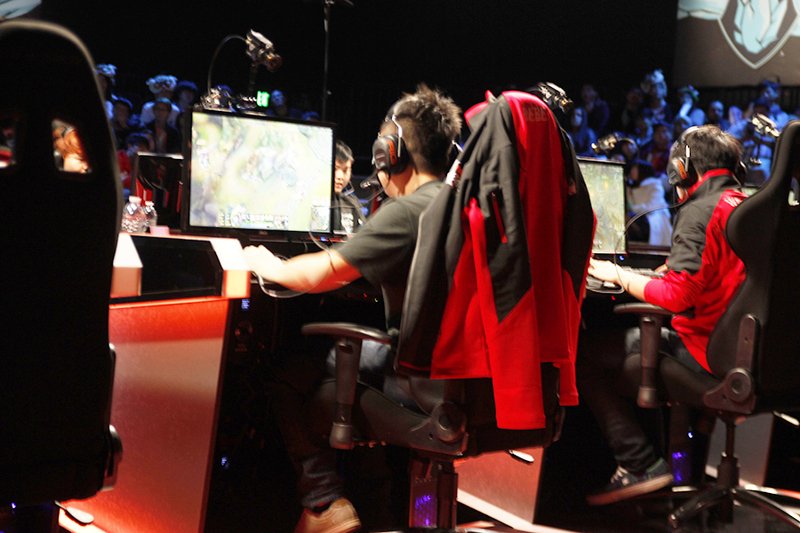 The same day that Ta graduated from high school, he entered into the League of Legends Championship Series. 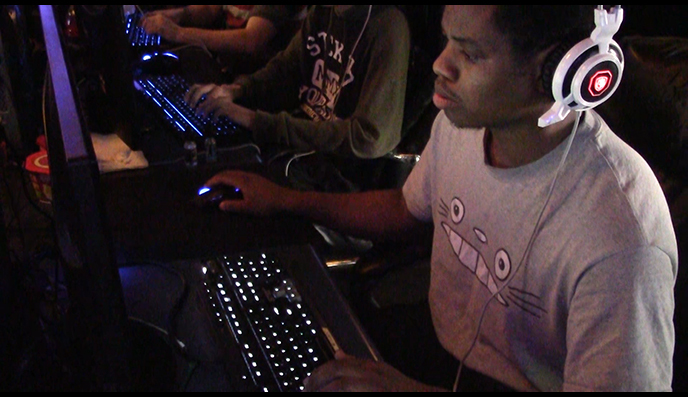 Steven Cobb spends his life training to qualify for the League of Legends Championship Series. Here are his thoughts on what it takes to become one of the professionals. Caroline "Artstar" Noquez and Emma "EmuhL33t" Powell of Team Karma, an all female eSports competitive team who play Counter Strike: Global Offensive, a first-person shooting game. The team recently placed 1st in a 2015 eSports tournament held in Copenhagen, Denmark. Noquez and Powell are top in the all-female first-person shooter eSports division, and when they are not practicing throughout the week, they are playing live with their fans for donations, in order to practice and earn money for traveling at the same time. Noquez is temporarily out of college and Powell is currently in nursing school in Santa Monica, taking time off to travel for competitions. Both players agreed that most players participate in eSports during their college ages due to the human body being "at its most alert" during this age. "There is this rumor that around 25 most eSport players seem to lose their reaction time," said Noquez. Considering the majority of eSport professional players are 18 to 26 years old, these young adults typically look to enroll in college. But after playing in eSports, they could need as much as $50,000 for school and housing finances for the first year, and only ten competitors in the top two teams, of a 16-team tournament, generally win this much amount of money while playing the sport. Professional player Caroline Noquez says that once a player reaches the age of 27, they are "out of their peak," and their mental abilities start to decline. "Just like any sport, it is not established as a long-term career," she said..
Once Noquez is done playing professionally, she will not receive a scholarship from the ESL (Electronic Sports League), or any organization affiliated with Counter Strike: Global Offensive eSports. Nor will she receive a pension or any similar benefit that professional sports players can obtain. "I will go back to school, but at this moment I want to use this time to play professionally with my team," she said. Stephanie Newcomb, the wife to the coach of one of the competitive teams, has been living in a house with her husband and five professional eSports players. She says that allowing players at this age to competitively play games as a lifestyle can create a lot of problems for the future. "It is often times difficult to know that these kids won't get a scholarship from this like football, and after they hit their peak age, they will have a difficult time adapting to the real world," she said. 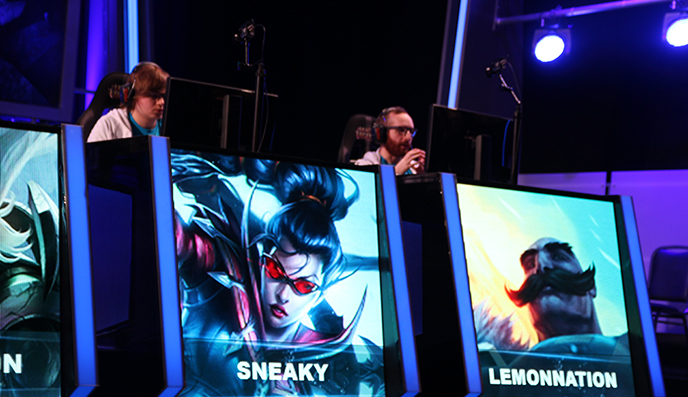 Riot Games support their competitive scene by providing a salary to their top eSports players. Top Korean League of Legends professional Lee "Faker" Sang Hyeok, 19, earned $207,158.85 in 2015, with only 43.18% of this in prize money according to eSports Earnings. The rest of his earnings are his salary given to him by Riot Games and KeSPA, an eSports association in the central government agency of Korea. Professional League of Legends player Cuong Ta, better known as his gamer name Flaresz, came into his professional career knowing that he wouldn't go to college after high school. "I had to get here right after I graduated, so I stopped school for a year because I wanted to pursue eSports," he said. Although he has been playing since age 14, the required age to participate in League of Legends World eSports is 17. "I'm not sure about college," he said. "I know I can make a lot of money and make a standard living. Players in Korea are making billions, so I don't think eSports is going to fall that easily in the future." 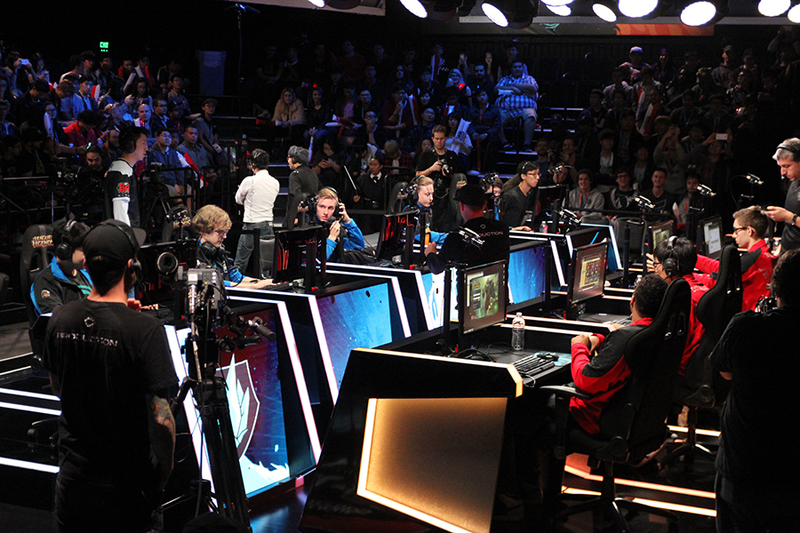 A majority of eSport competitors travel across continents and practice 10-12 hours a day. This takes time away from college and education. These competitors, aged 17-25, on average, are dropping out of school to pursue a title of a professional, globally known, eSport player. Yet there is no security for a job or college fund for players when their competitive careers end. National Collegiate Athletic Association's (NCAA) Associate Director of Public and Media Relations Gail Dent said that eSports has not tried to reach out to the NCAA. "At this time, there is no proposal in the system regarding video game tournaments or 'eSports' becoming an NCAA sport," she said. Surprisingly, the National Collegiate Athletic Association's (NCAA) Associate Director of Public and Media Relations Gail Dent said that eSports has not tried to reach out to the NCAA. "At this time, there is no proposal in the system regarding video game tournaments or 'eSports' becoming an NCAA sport," she said. She said eSports must go through one of the two approaches for a sport to become an NCAA sport. Many young professionals have not approached the NCAA with a request to compete at a university level in part because of the way the NCAA defines the word sport. 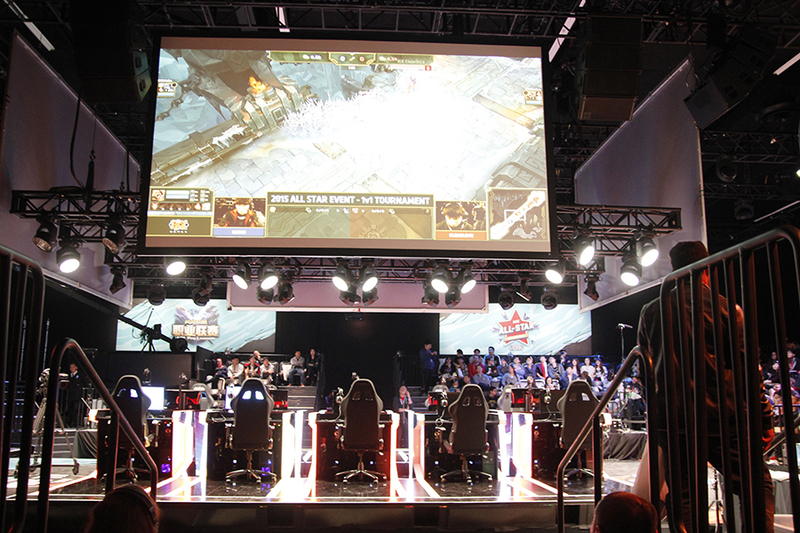 eSports must go through one of the two approaches for a sport to become an NCAA sport. "One is the emerging sports program for women's sports, and the other way that a sport can reach championship level is our championships bylaw section," said Dent. According to the championships bylaw section in the NCAA Division I manual, eSports would need 50 colleges to sponsor the sport for two years consecutively, must be single gender, and provide separate men's and women's teams for the same sport. "At this time, there is no proposal in the system regarding video game tournaments or 'eSports' becoming an NCAA sport." Before something like this can happen, the NCAA Division I manual also states that the sport must be a "club sport" that is funded by a university or college, and competes with other universities or colleges. While club sports may sound the same as NCAA sports, they are regulated by the schools, and not by the NCAA. Club sport teams do not receive scholarships for competing as well. This sounds like a challenge for the collegiate side of eSports, however, the USC eSports Club, its teams, and the many universities USC competes with without financial support and supervision of the school. 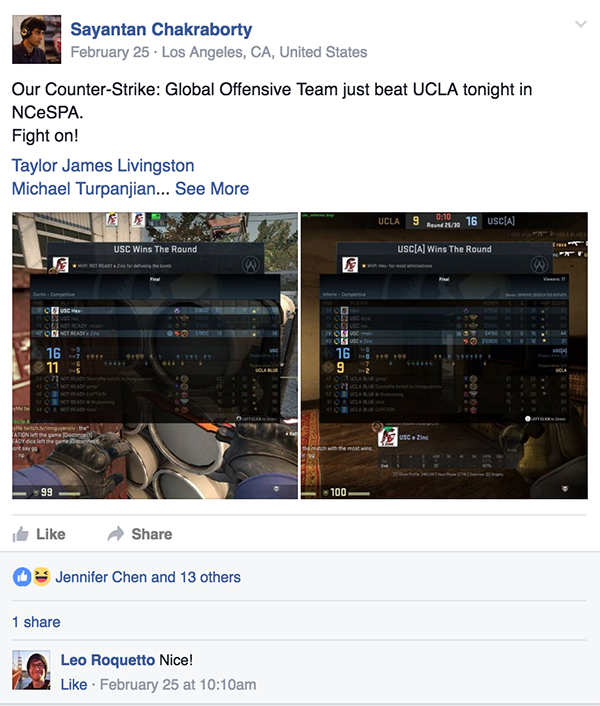 Did you know there was a USC eSports team? 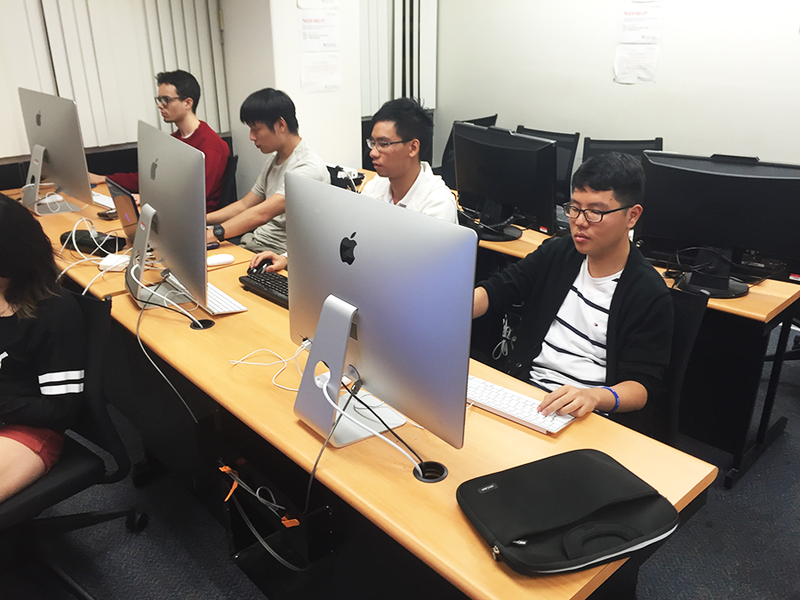 Every Friday from 6-8 p.m., college students from different programs at USC gather together at Olin Hall (OHE) in rooms 540 and 542 and meet to watch or play eSport games. "We are all about fun, and each week it's great to have student come to blow off some steam and enjoy playing games with others who have the same interest," said Jennifer Chen, the president of USC's eSports club. "Because it is a community in some sense, there should be a home. 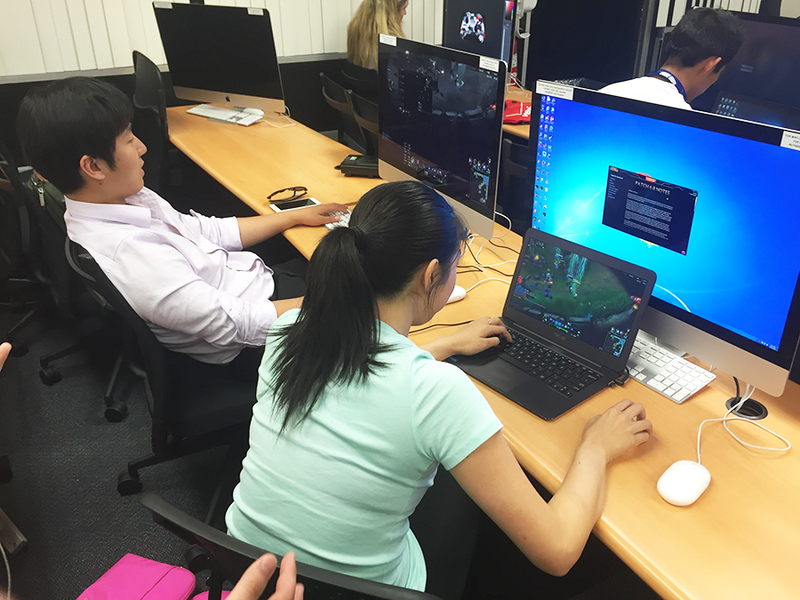 If you are seeking competitive or casual play (at USC) we facilitate the places," she said. "So what I specifically do is find people in the community already who are really passionate and convince them to put in hours, get paid, and put time back into the community." The eSports club is a recognized student organization. There are about 18 people on each team. 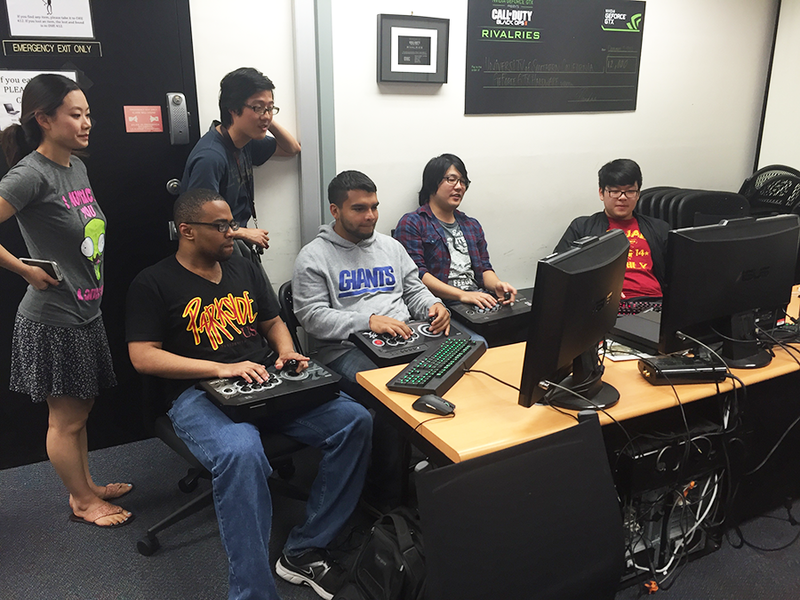 There are 80 active players who come to the eSports club on a regular basis. 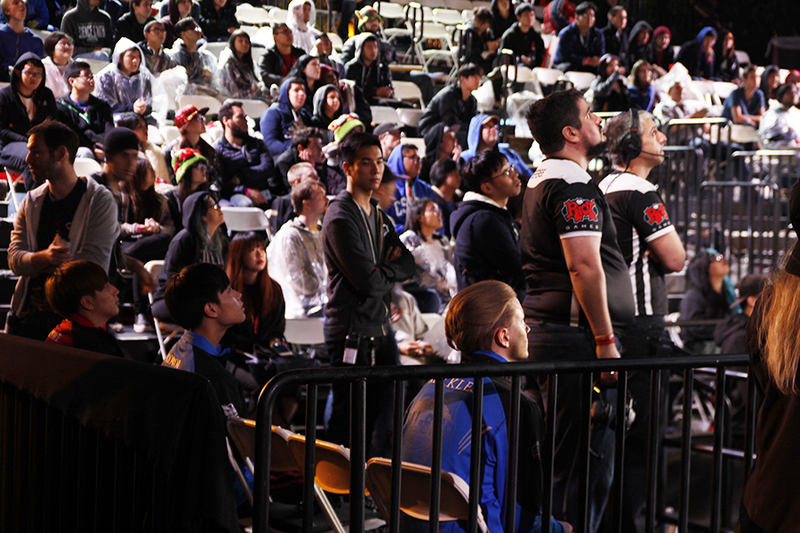 The League of Legends team is in the top 64 west coast. 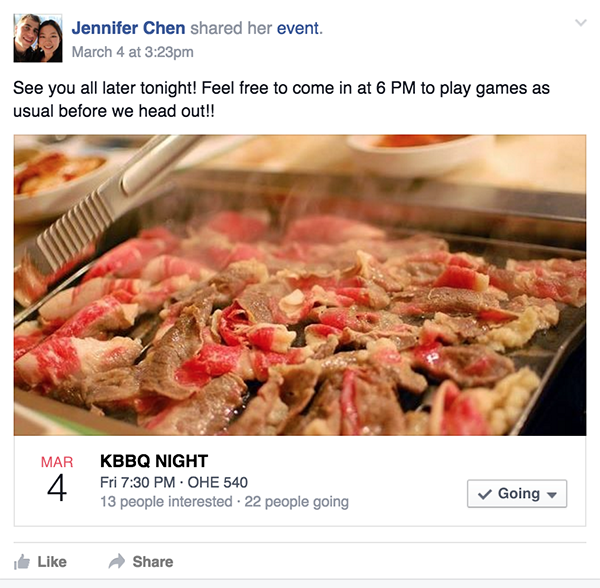 Here are events and activities posted in the eSports club public Facebook social media site. 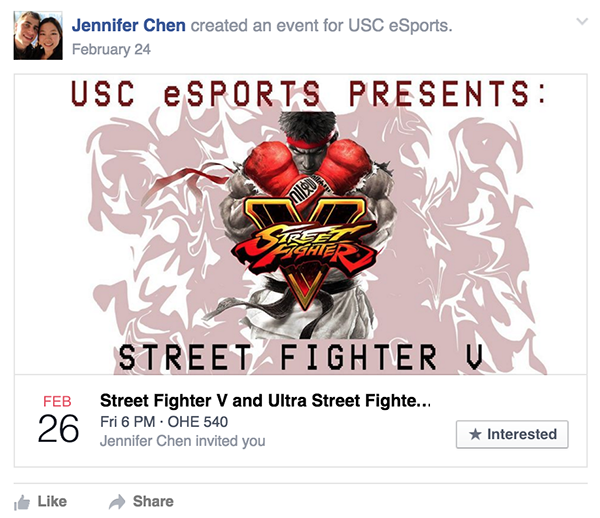 Jennifer Chen is the president of the eSports club at the University of Southern California. She said the USC eSports club has six teams all together, each competing in a different type of eSport games. "As president, I don't make passionate players, if that makes sense. And I don't train our competitive team," she said. "My main priority is making sure that these people have a place to be." Chen said the USC eSport teams have never tried to become club sports because the club decided to invest more of its time more into its members. "If you are seeking competitive or casual play [at USC] we facilitate the places," she said. "So what we specifically do is find people in the community already who are really passionate and convince them to put in hours, get paid and put time back into the community." Michael Duan, manager of one of the eSport Club teams at USC, said that although the university doesn't fund the team, it competes with other schools throughout the country. 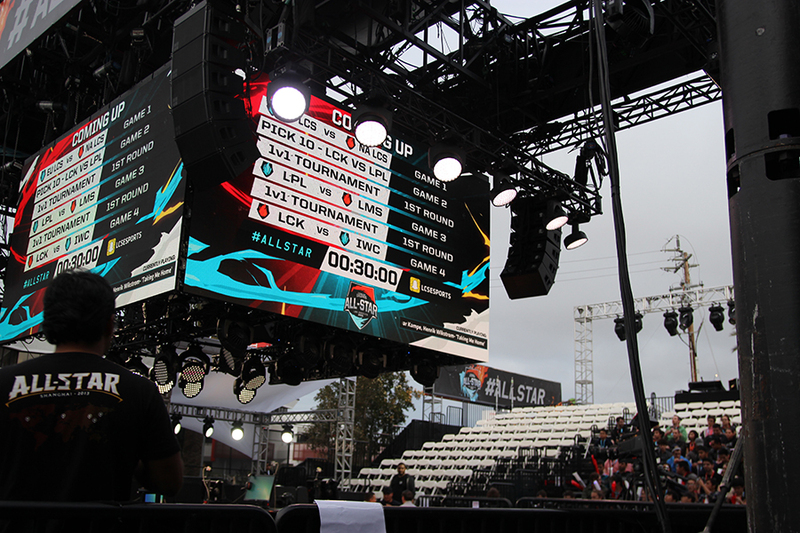 "The USC eSport teams compete in a tournament called The Collegiate Starleague (CSL), an intercollegiate league for North American colleges and universities," he said. "Although the tournament revolved around universities and colleges, it is not regulated by the schools nor the NCAA." Paul Stutes, Chief Technology Officer at CSL, confirmed what Duan said. 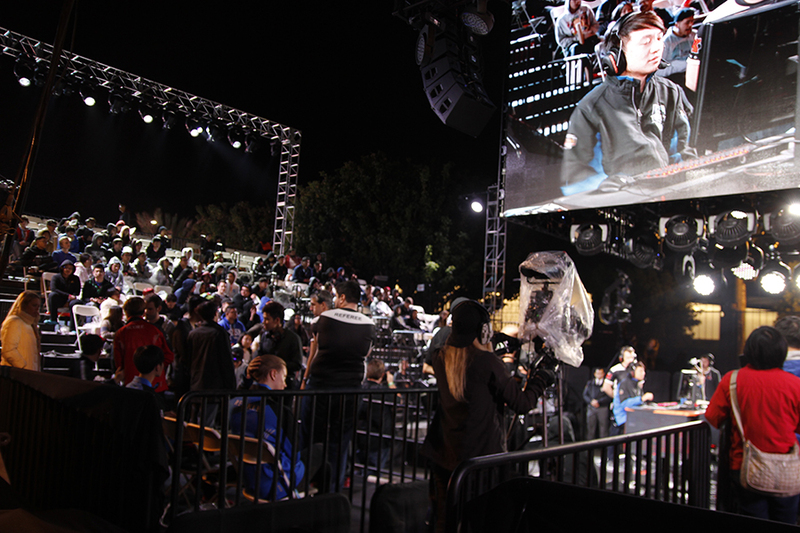 The USC campus was one 450 universities who created a time and place on campus dedicated to eSports. “We had 850 teams this year across all eSports games, and we always try to define rules and stipulations as morally responsible as possible, given that these are college students and we would not want to jeopardize their university standings while playing with us,” he said. Victoria Jackson is a sports historian whom specializes in college sports, as well as a former NCAA student-athlete. Click on her picture to hear more on Jackson's perspectives. 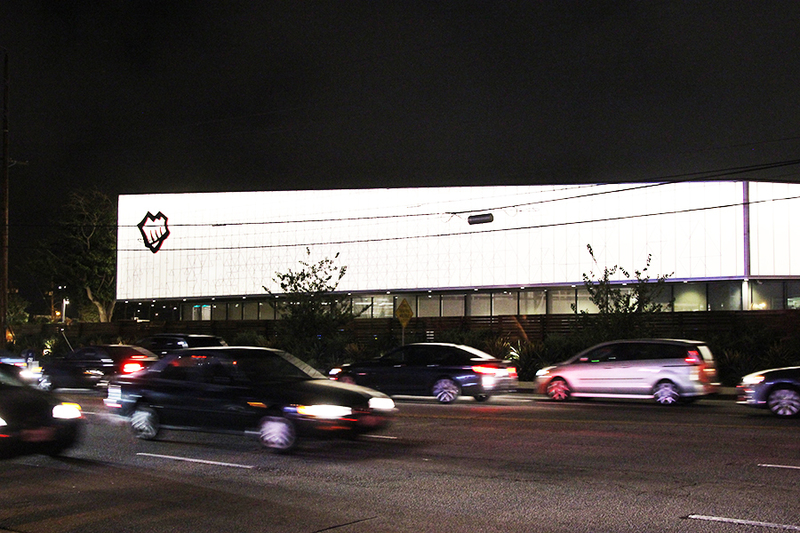 While the USC eSport club plays against schools similar to college sports, there are doubts about whether this sport can become a NCAA sport. Victoria Jackson, a sports historian professor and former NCAA student-athlete, does not believe it falls in line with the NCAA's values of sports participation and health benefits. "This kind of culture of snacking while playing video games, the use of energy drinks, use of caffeine and other uppers…that's an opposite direction of the perceived health benefits from the participation in sports," she said. She said the NCAA advocates a "Sound mind, sound body" philosophy that says the one who exercises is more productive in the classroom. Jackson said if eSports is similar to anything, it's bowling. "Bowling is an indoor sport, is televised on ESPN and you do have NCAA teams, she said. "While the NCAA sport bowling may have similar conflicts as eSports, it still involves some sort of physical activity. Jackson discussed this topic in a panel looking at eSports as the future of entertainment with Craig Levine, CEO of the leading eSports league Electronic Sports League, and author T.L. Taylor of Raising the Stakes: E-Sports and the Professionalization of Computer Gaming. Watch the entire panel here. (left to right) Victoria Jackson, Craig Levine, T.L. Taylor, Seth Stevenson. "Are eSports the future of enetertainment?" panel presented by Future Tense, a partnership between New America, Arizona State University, and Slate. During the panel, Taylor spoke about the problems that eSport players face with financial sustainability just as traditional athletes do. At the top performance levels, people who have secured contracts for themselves, who live in a gaming house and going around playing, are living a lifestyle that is similar to most traditional athletes," said Taylor. "But just like traditional sports, you will have most athletes not making a ton of money and doing something because they really love it, and eSports have a large chunk of players like that." Taylor and Levine also mentioned that eSport players now have legal representation, sports psychiatrists, training sessions, and lead a healthy lifestyle. This is an edited interview with Victoria Jackson, a former NCAA student-athlete and sports historian who specializes in college sports. This interview is abridged in the interest of brevity. Q. 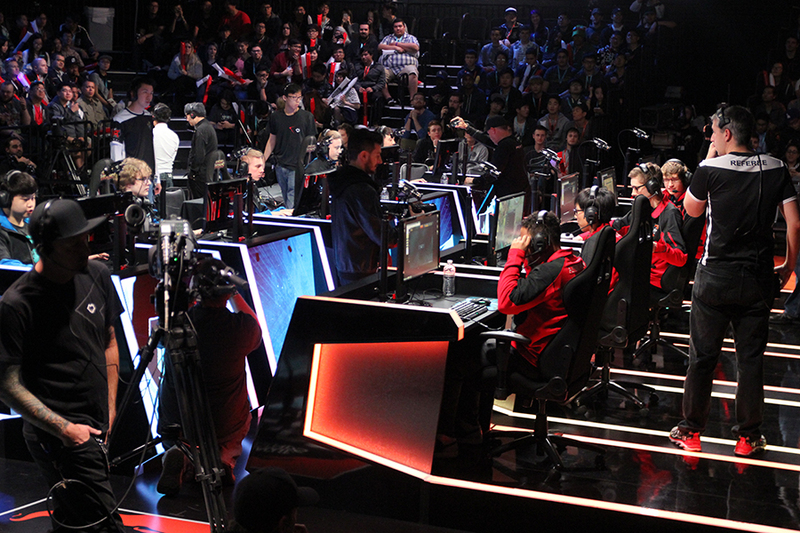 And what do you think about an eSport competition becoming NCAA wide? A. I don't think it falls in line with the NCAA's values of sports participation and health benefits. Kind of why the idea that sports exists in higher education is kind of because of this "Sound, Mind. Sound, Body" philosophy that the one who exercises is more productive in the classroom. There's an enlightenment influence with this, and we have many educators speaking to the importance of participation in inner collegiate athletics and the educational benefit of that in higher education and also in public education of K-12. Q. What do you mean "educational benefits"? A. So those benefits that educational leaders listed, as far as the values and virtues of sports, many of them either aren't in existence with eSports, or eSports creates the opposite effect. This kind of culture of snacking while playing video games, the use of energy drinks, use of stimulants, caffeine and other uppers…that's an opposite direction of the perceived health benefits from the participation in sports. Q. Do you think there are other reasons why the NCAA would oppose eSports as a Division I or II sport? A. There's also time commitment concerns. There is a big criticism of NCAA members and institutions that student athletes are spending too much time on their sports. So they placed restrictions on how much time student athletes may practice each week, and that's 20 hours per week. In many of these teams, they're practicing 40 or 50 hours a week, and some of that time is spent by the individual practicing or studying the sport by themselves, which is technically not mandatory, but in order to keep his spot on the team or starting position, he still needs to be doing xyz on his own time. If eSports takes up a lot of time, and there's restrictions on time commitment put into place – and the consideration that you do have to perform well in the classroom as a student athlete – I am not sure if an eSport student athlete would be able to restrict themselves to just 20 hours a week. From my understanding is that it has a much larger time commitment then that. At least in the tournament type of situations. 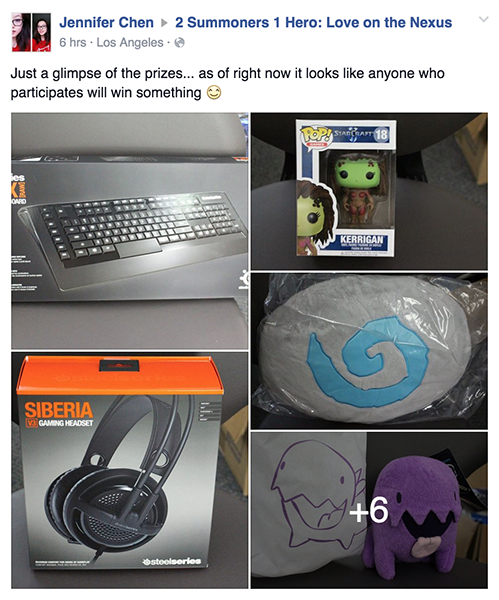 There are those who never plan to go to college in order to pursue an eSport profession? Click to hear the stories of those who have built their lives around this dream. Nielsen Ratings, an organization that studies consumers in more than 100 countries to provide the most complete view of trends and habits worldwide, reported the viewership of one eSport game in 2015 surpassed both the NBA finals and the BCS national championship game by over seven million viewers. Marina Paul, the Staples Center communications manager, confirmed that they will be hosting another eSport League of Legends World Championship Series by developers Riot Games, as the arena did in 2013. Despite ESPN President John Skipper declaring that eSports were not "real sports", the competitions still air on his channel. "It's not a sport — it's a competition. Chess is a competition. Checkers is a competition….Mostly, I'm interested in doing real sports," he said, according to Re/code. 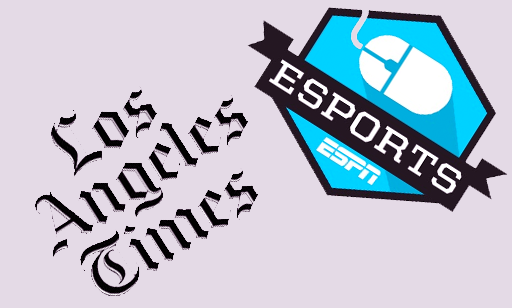 Only a year after Skipper's remark in 2014, eSports now has its own section of daily news on both ESPN and Yahoo News. 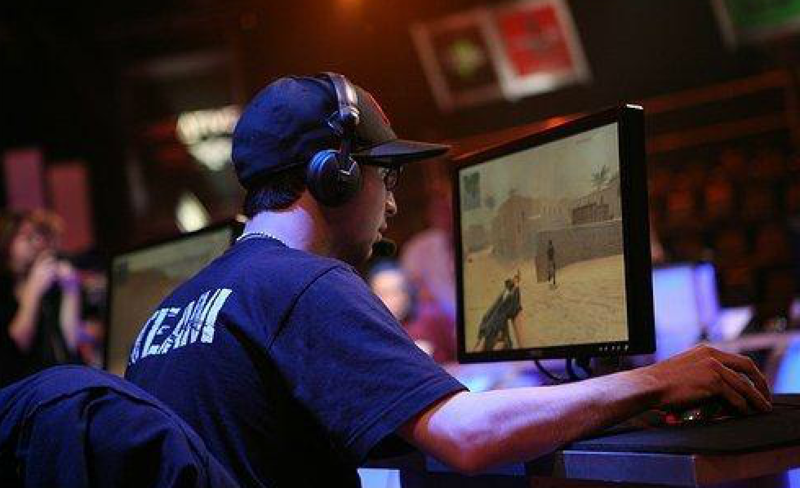 Mikey Perez, gamer name "Mikeytux", stared in Spike TV's eSports television show, "XFX Challenge"
Mickey Perez (28), a Counter Strike eSports professional in 2003, said he has seen a drastic change in the last three years. "I played the original Counter Strike when eSports were just classified as gaming tournaments," he said. "The most I made was about $3,000, but my team did get to air on a television show during it." After eSports he went to community college for music, but did not intend to use it towards his career. "I played competitively and also worked at a gaming cafe for ten years. I just wanted to do something that was away from the gaming scene and I really enjoy singing," he said. Perez currently works 12-hour shifts as a manager at Myung Ga Tofu & Korean BBQ in San Bernardino. "eSports" have been around in some way, shape or form since the early 1970s. But in the last two decades its popularity has grown drastically to make it a very profitable industry. 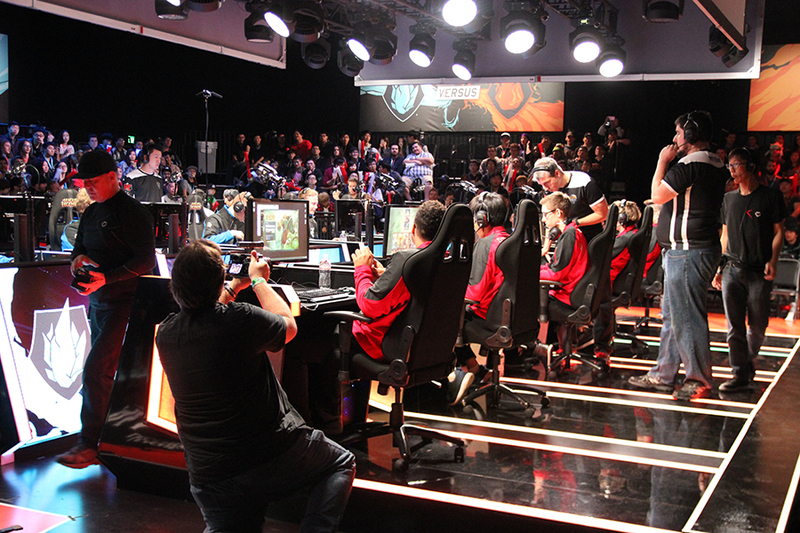 Although the use of the term "sport" in relation to electronic video game sports is not considered valid by many critics, Perez says the global impact of eSports is undeniable. "It has been fun to watch [eSports] go from what I knew to what it is now, over the last three years," said Perez. "There is no denying that it's getting closer and closer to impacting what we call sports now."